For years now, 3D projectors have been slowly making their way into home theaters around the world, and almost all of those projectors use active shutter glass technology. Active shutter glasses are advantageous in that they keep the cost of the projector low and do not require a special screen in order to function, making them a great out-of-the-box solution for the home consumer. If you purchase a 3D projector that uses active shutter glasses, there are no more pieces to buy -- you're done. However, for various reasons, some folks don't enjoy active shutter glasses. The eyewear is heavier than the glasses used in commercial theaters. Different brands of eyewear are not compatible with one another. Since the glasses are powered, they either need to be recharged or have their batteries changed. And they're expensive, too, at around $100 per pair. If you want to bring some friends over and watch a movie in 3D, it can mean a significant cash outlay to pick up extra glasses. Enter the Volfoni SmartCrystal Pro. 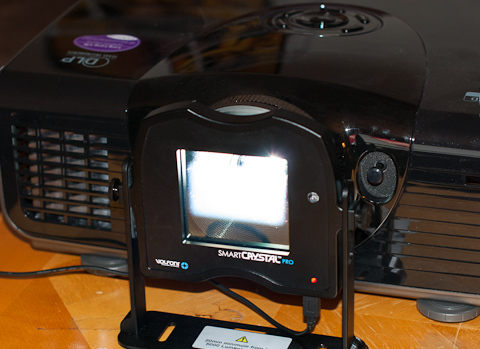 Like many commercial theaters, the SmartCrystal Pro uses a switching polarized filter positioned in front of the projector. This allows it, with the help of a silver screen, to use inexpensive passive polarized 3D glasses instead of the expensive powered active shutter glasses. This way, you can accommodate as many people as your theater can hold, and additional pairs of glasses cost very little. The system, which costs $1500 and includes five pairs of glasses and all necessary connection cables, is currently only available direct from its manufacturer, Volfoni. 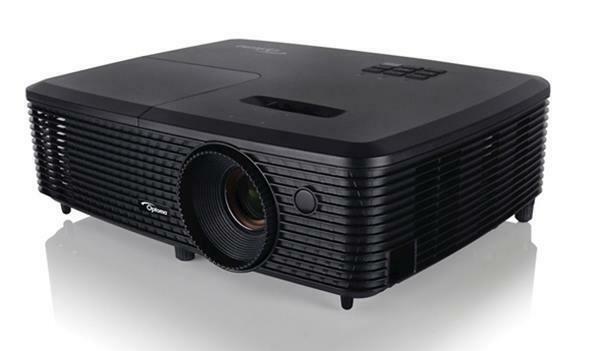 At the moment, it also requires a DLP 3D projector that supports either VESA output or DLP Link. It is, however, the first polarized 3D solution we've seen that is both affordable and easy to use. The SmartCrystal Pro is a switching polarizer designed to work with 3D home theater projectors. In essence, it converts these 3D projectors from active-shutter to passive-polarized systems. It is rated to work with projectors up to 5,000 lumens in brightness. The SmartCrystal Pro system consists of only a few parts. There is the polarizer itself, the connection cables, and the included glasses (the system comes with five pairs). The whole system fits in a small box. Setup consists of placing the polarizer in front of your projector and running one wire, either VESA sync or power (in the case of DLP Link). In other words, you need an existing 3D setup, plus a silver screen. The reason for the DLP requirement is that some LCD and LCoS 3D projectors already emit polarized light, and that can cause some odd behavior when paired with another polarizer. Volfoni is working on another version of the SmartCrystal Pro that will function properly with LCD and LCoS models, and that version should be announced in the coming months. What the SmartCrystal Pro does is takes the synchronization signal normally meant for active shutter glasses -- the signal that tells the glasses to switch between left eye and right eye images -- and instead uses it to signal the switching polarizer to swap between left-hand and right-hand circular polarization. The polarized light bounces off of the screen and is selectively passed by the glasses to your eyes. That's why a silver screen is necessary; normal white screens do not maintain polarization. There are some non-silver screens that maintain polarization, but don't just assume your existing screen is one of them. Our testing setup used the BenQ W7000 1080p DLP home theater projector and a 92" SeVision 3D GX silver pop-up screen from Severtson in addition to the SmartCrystal Pro. Hi, What about ghosting and hot-spotting. Did you test these? We did not notice an abnormal amount of crosstalk, which I referenced in the article. The crosstalk is similar to that observed on some other 3D projectors we've seen recently. However, the DLP Link glasses meant to be used with the W7000 did have less crosstalk. As for hot-spotting, this is a property of the screen, not the polarizer, and we didn't feel it appropriate to discuss the screen properties in a review of the polarizer. That said, we didn't see any appreciable hotspotting on the Severtson SeVision 3D GX, either. If I were to purchase one, though, I would consider a tab-tensioned electric model, because the pop-up model we used did have some small waves in the material. Hey, thanks for the info. cheers. $1500 is a pretty high pricepoint for a DIY'er modification. Just bought a passive 65" for about the same price with no additional cost of silver screen. Until they come down to $500-700, it's probably worth the hassle of aligning 2 DLPs with polarizing filters, given the light loss you get with the unit.